This is a tea bowl of the Haikatsugi (ash-covered) type, called by this name from its iron glaze which makes the bowl look as if covered with ash. Also characteristic of this type vessels is the application of two different glazes. In this bowl, the yellow glaze which was applied beneath the black glaze is visible around the hip just above the unglazed clay body. 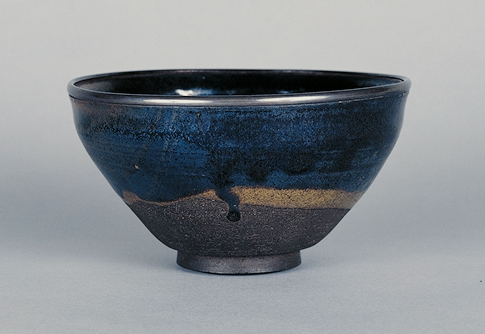 The tea bowl was handed down in the Date family, and according to records, was displayed when the Tokugawa Shogun Iemitsu and the former Tokugawa Shogun Hidetada visited the Edo residence of the Date clan on April 6 and 11th respectively in 1630.